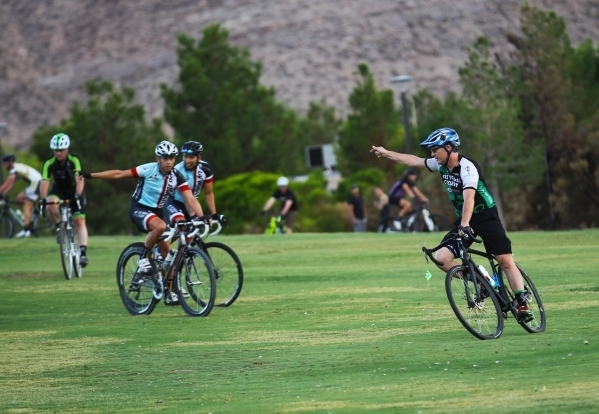 Business transactions and networking take a less formal route when members of a Las Vegas cyclo-cross group are striking up businesses conversations and making deals while they train for cycling competitions. Business transactions and networking are taking a less formal route. Members of a Las Vegas cyclo-cross group are striking up businesses conversations and making deals while they train for cycling competitions. They practice every Tuesday or Wednesday at various parks across Las Vegas. One member, Las Vegas resident and cyclist Brian Larson, even landed a job after he approached a fellow member who was selling a bike. Larson is the Southern Nevada account manager at Darling International, a developer and producer of sustainable natural ingredients from edible and inedible bio-nutrients. “It was a business deal on wheels,” he said. Larson’s story isn’t the only business deal that’s happened within the group. Mike Hileman, owner of Eye Gear Sports Optics, opened his business in the same space as Bike Shop at 2630 Windmill Parkway in Henderson. Hileman, who offers eye glasses and accessories for all sports including golf and tennis,finds the cycling community is his biggest networking channel. According to Larson, the group boasts nearly 400 members in almost every industry. Both Hileman and Larson hope the group expands. “I’d love to see continued growth and participation so more and more people come out and get into it,” Hileman said. Although the group is gearing up to participate in CrossVegas, a Union Cycliste Internationale World Cup event at Desert Breeze Park in September, Larson would like to see Las Vegas host more cycling competitions. For more information about the group, contact Larson at mountainbikefly@gmail.com or Steve Clausse at steve@lasvegascyclery.com.